I never got a chance to tell you all this afternoon, but I’m happy to announce that I survived my week 2, Day 8, double upper body workout this morning! I knew that I would “survive,” but I was honesty I little nervous to see how my arms would be feeling after Saturday’s workout. Luckily, I woke up only slightly sore, and knew I would be able to push through. 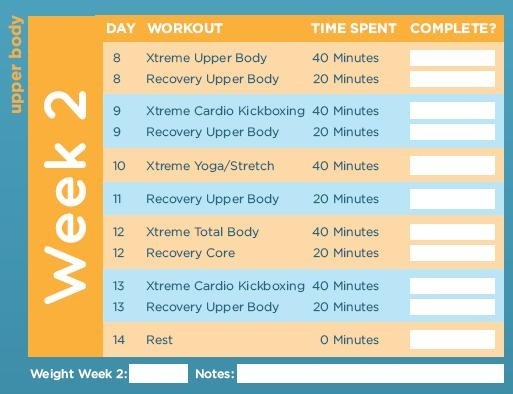 Surprisingly enough, it actually wasn’t as intense as Saturday’s workout (I think it was the lower body recovery workout that killed me before) and I felt motivated enough to add in a little extra cardio. 20 minutes was the max that I wanted to spend on the treadmill, so I put together a quickie routine that looked something like this. You’ll notice that the speeds stay the same, but the amount of time recovering in between sprints gets shorter as you go. It was quick, intense, and perfect for when you need to fill up just 20 minutes. 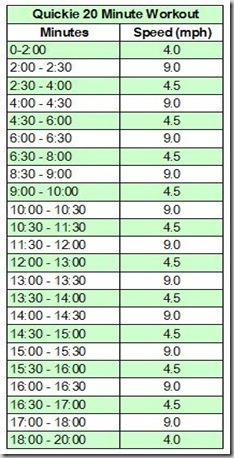 As always, just adjust the speeds to suit you (4.5mph is a fast walk for me). I’m actually working again this afternoon, so I had to pack up the lunch to go today. 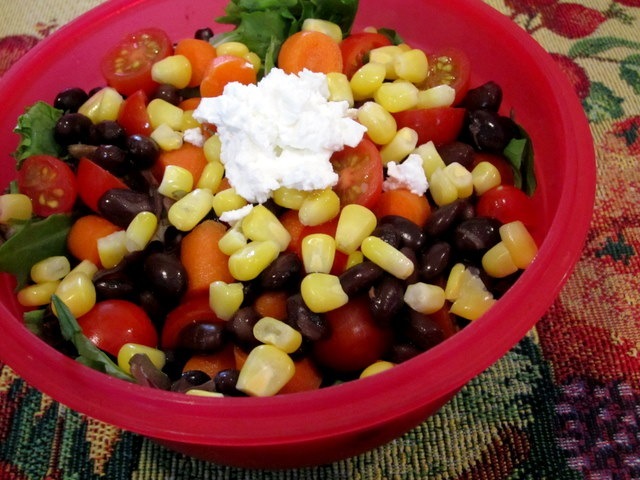 Last night, I put together a salad made of spring mix, tomatoes, carrots, corn, black beans, and a slab ‘o goat cheese. I also have some pineapple salsa packed up separately to add on top. To go along with my salad, I have a peach and a Chocolate Chip Cherry Torte Larabar, one of which will probably be my 3:00 snack. Hopefully I’ll be able to get a little bit of studying done this afternoon, too. I barely had a chance to crack open my book this entire weekend! What are some of your favorite mid-afternoon snacks? I usually want something sweet in the afternoon, so maybe a granola bar or a piece of dark chocolate. Bananas are also a big favorite because they're portable and delicious. Your lunch looks so good1 My favorite afternoon snack is yogurt with some granola, smoothies, or apples with peanut butter! My favorite mid afternoon snacks are apples and peanut butter, dry cereal, or greek yogurt. 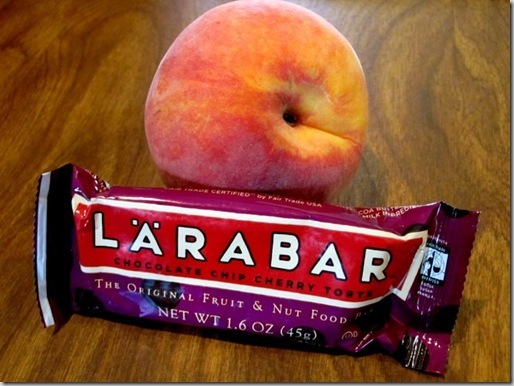 Today I have a Larabar too:) The peanut butter cookie ones were on clearance for 74 cents! I was in heaven. Nice choice with the goat cheese! 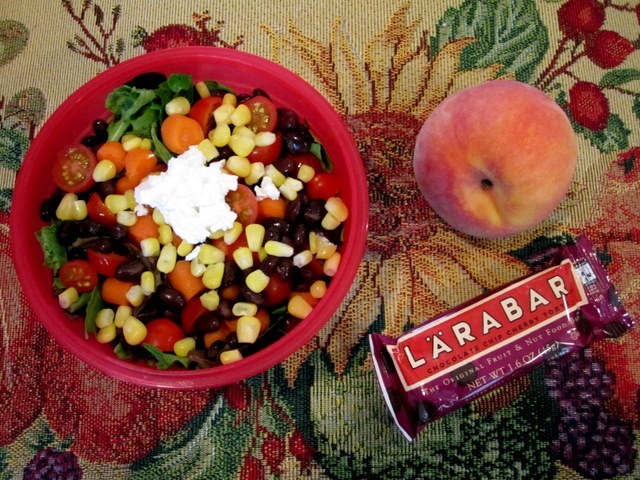 My favorite snacks are fruit + cottage cheese, wheat english muffin + Laughing Cow wedge, pears, and veggie chips + salsa. Yummy looking salad. My favorite snacks are energy bars, apples, seaweed snacks and sometimes a small bowl of cereal. I just bought my first Larabar the other day. I got the Coconut Cream Pie one, but haven't tried it yet. The Chocolate Cherry Torte one sounds good too. For my afternoon snack, I like a Greek yogurt with some fruit added in. It fills me right up and holds me over 'til dinner. The second half of my morning smoothie! It is usually in the freezer all morning just waiting for me! ... I like your afternoon snack though! Looks delightful! smoothies are my newest thing. I used to just make them for breakfast but now they're a great afternoon snack too. I love hummus and pita chips for my snack. I have to make sure to divide it out though because I"ll eat it all in one sitting. it's so good. I'm having one of my favorite afternoon snacks right now - chobani 0% greek yogi, yummm! One question I have: do you struggle with adjusting the speed during quick intervals like in your above workout? I feel like it takes me almost the entire recovery period for my grubby little fingers to finally push decrease speed enough times to even get to my recovery speed! I know what you mean about switching the speeds, Diana! Fortunately, my treadmill here at home has one-push buttons for speeds, so it's a lot easier for me to switch back and forth than it would be with the up/down buttons. For afternoon snacks I have many favorites. I like apple and almond butter, granola with dried fruit and nuts, hummus and mini pita or veggies, frozen berries, smoothies, bananas, almonds and raisins, frozen grapes and on a really hot day watermelon. I love afternoon snacks, probably even more than lunch. My most common go-to is plain Greek yogurt that I dress up with blueberry flaxseed, PB2 powder, almonds and raisins, defrosted frozen strawberries (gets all saucy) or granola. I love how versatile it is and keeps me full for a few hours. I love Fiber One Brownies for a great mid-day snack! I've been lovin nectarines sprinkled with chia seeds and a side of peanut butter. I can already tell you are going to be a great personal trainer. 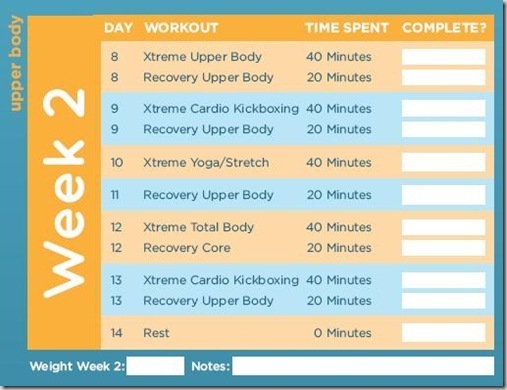 You inspired me to mix up my routine and try the xtreme total body workout and I am, well, feeling it! Tomorrow should be interesting! That is SO nice of you to say, Shana! Thank you!! :) I'm so glad you're trying something new. Definitely prepare to be SORE...in a good way, of course lol! Great workout! :) My favorite afternoon snacks are usually an apple or carrots with peanut butter or some kind of a bar like a Luna Bar or a Larabar. A new one of mine is sunflower seeds and dried cranberries! My fav afternoon snack is either greek yogurt or cottage cheese with blueberries and almonds. Yum!!! Great workout and snack! I believe in High Intensity Training and I believe that it is the best way to lose weight on early stages and to keep it off when the goal is already attained. Of course you have to limit your food intake, but regular exercises burn your fat and give you a good shape. It is also vital to provide enough nutrition for your body, and I've found the perfect solution for that - military grade nutritional supplements. They give me perfect tone and energy, so I am always prepared for intensive workouts.